View live Data Slider application demo! The Data Slider application was built with Node.js using the ATSD Node.js API Client. It is used to display a dataset in an interactive way, similar to a PowerPoint presentation. 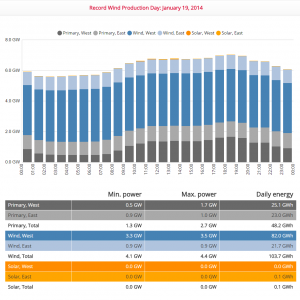 This application is telling the country’s renewable energy success story with data. Data is continuously updated. Such presentations can be easily built for any prior year or for the current calendar year. 10+ analytical widgets can be easily added to slice and dice the information from various angles. No coding is required – presentations are built from simple configuration files with macro support for high productivity. When creating slides that visualize weeks, years or months, a template configuration file is created and then iterated. This approach removes the necessity of creating separate configuration for each individual slide. Query results from ATSD are cached on the server to increase the application’s speed. Slide configurations are organized in folders, they are ordered using a table of contents file that determines in what order they are displayed.